WEDCO is a nonprofit 501(c)(3) regional economic development corporation founded in 1993 for the sole purpose of promoting economic growth in the eastern Lakes Region. Our primary purpose is to create jobs for area residents by assisting established or developing businesses in their endeavor to be successful. Our consultation assistance is available at no cost. Strict confidentiality of client information is maintained. The Eastern Lakes Region is WEDCO’s service area. It is in a unique position in that it includes the northern Strafford and southern Carroll County areas. We are located along the eastern shores of Lake Winnipesaukee in the town of Wolfeboro. The valuable potential of the eastern Lakes Region has been overlooked. The founders of WEDCO believe we must plan now to attract the proper mix of business and industry to our area or we run the risk of having a very fragile, variable economy. One element of growth will continue to come from established businesses in our towns. WEDCO must encourage and assist existing local business by providing sources of capital, experienced advice, and a receptive business climate. A second, equally important element of growth will be derived from WEDCO’s concerted effort to attract new businesses to the area. Our focus will be on companies that will provide people with the opportunity to compete for well paying, skilled, long-term jobs. More jobs that pay higher wages will lead to more spending in the area. We must, however, ensure that businesses will use and enhance our natural gifts without degrading them. 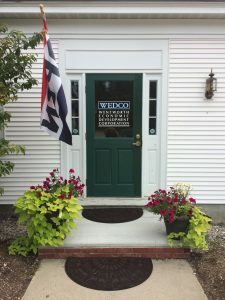 New businesses locating in the area can look to WEDCO for capital, for advice based upon local experience, and a receptive attitude. By accomplishing these objectives, we will create more jobs and higher wages while protecting the intrinsic benefits of the area. Over the years WEDCO has partnered with many local groups and committees to help further their mission by acting as their fiscal agent, provide technical assistance, providing meeting space, etc. Supporting these groups furthers WEDCO’s efforts of promoting economic growth in the region while protecting and enhancing its intrinsic benefits. Cotton Valley Trail – Efforts to build the Cotton Valley Trail began in 1992. This recreational multi-use trail was completely in 2017. The trail extends 12 miles, linking the towns of Wolfeboro, Brookfield and Wakefield, via a former railroad right-of-way. An active committee of volunteers continues to make enhancements to the trail for its users. Explore Moose Mountains is a grassroots, non-profit initiative to promote the Moose Mountains Region of New Hampshire. It began in 2014 when a group of engaged citizens contacted Strafford Regional Planning Commission (SRPC) for technical assistance related to regional tourism.To date Explore Moose Mountains (EMM), has made significant strides, building upon the original ideas and goals from the initial visioning sessions and meetings. In 2016 EMM received a New Hampshire Charitable Foundations (NHCF) grant, which has supported recent operations, including the launching of its own website and the EMM Facebook page, @TheMooseNH and creation of marketing and promotional materials. Greater Wakefield Resource Center, Inc. The Eastern Lakes Region Housing Coalition, Inc. (Coalition) began its working relationship with WEDCO in 2004. The Coalition was a fledgling group in the process of defining itself, setting its mission and goals, and establishing creditability in the greater community. The active support of the WEDCO Board of Directors and more directly their staff was a major factor in the successful development of the Coalition. Prior to receipt of the Coalition’s 501(c)(3) non-profit designation, WEDCO served as the fiscal agent for our corporation. The record keeping and reports were professional, timely, and accurate. Staff is always responsive to requests for checks, interim information on accounts, and acknowledgment to donors. She maintains a comfortable working relationship and is always ready to share expertise and helpful assistance. The Coalition and WEDCO have continued our affiliation as we recognize our common goal to support the regional economy. This relationship has benefited the work of the coalition with the support and assistance of a highly respected and professional organization. Chair, Eastern Lakes Region Housing Coalition, Inc.